The Guantánamo Public Memory Project is very pleased to welcome a new member of our team, Lisa Novak. As an introduction, Lisa has written this latest installment of the Guantanamology series. Stay tuned for more from her and from the series in the future. I recently joined the Guantánamo Public Memory Project team to work with the materials in the project’s physical collection, and to contribute some of my own memories of life on the base. While I am currently a student of Library Sciences here in New York City, I retired from the Navy three years ago. As I navigated my way around the GPMP website for the first time, I realized just how fleeting my own memory was of the time I spent on the naval base. 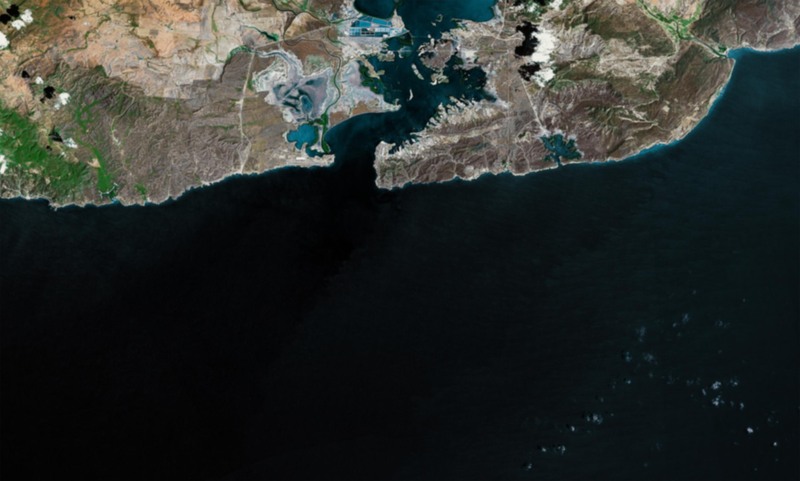 The project illustrates the importance of collecting information from a variety of sources on a subject that has been shrouded in secrecy, misinformation and a lack of transparency or objectivity from official sources. I completed a week-long assignment in 1994 and was deployed to the base a year later in support of Operation Sea Signal (aka Joint Task Force 160) from November 1995 to February 1996 when the operation came to a close. 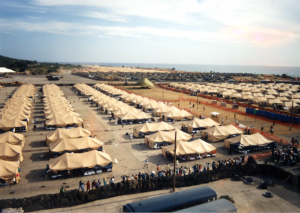 Unlike the service members permanently assigned to the naval station, the JTF lived in the hastily-erected tent-city that carpeted a large chunk of the base following the rapid influx of more than 45,000 Cuban and Haitian refugees. For the first month or so I lived in a tent in camp Golf. All of the various camps were unceremoniously named for the phonetic alphabet including the infamous camp X-Ray. As the operation drew down, we moved to another camp toward the end of the alphabet though now I can’t recall which one, possibly camp Sierra. There we traded in our tent for a field morgue (a giant, accordion-style box) which held 12 cots, 12 small shelving units, lights and little else. We had no indoor plumbing. Toilets and showers were located in trailers not too far from the living quarters. There were few paved roads on this side of the base. Meals were served in a huge galley tent. The physical conditions we lived in were similar to those of the refugees. But one glaring difference was that we knew when we were going home. Also, we were there voluntarily and we weren’t confined to the few hundred square feet of our camp. This looked like a great assignment for the permanently stationed servicemembers. There were great facilities, the weather was fantastic and you would never have to pay for a flight back to the states when you went on leave. One of the best things about the base was its sheer physical size. You could actually find any number of secluded spots to hang out for a few hours and pretend you weren’t in the military. Looking back, there seemed to be a lot of pretending going on. 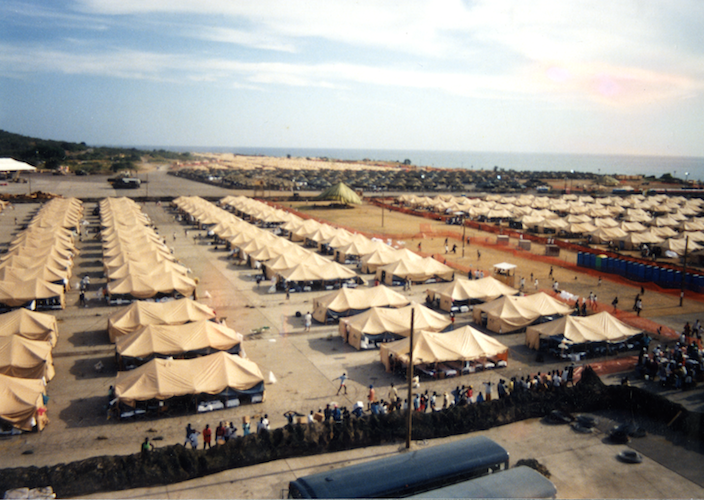 During normal operations – when families live on the base – the atmosphere was much like the imagined small towns portrayed in movies and on television during the ‘50s and ‘60s. While the social make-up of most military installations attempt to mirror that feel, you can’t walk out the gates of GTMO for a reality check like at other military bases. So residents could pretend they lived in ‘Leave It To Beaver-ville.’ Prices at the commissary, shops and other outlets are kept artificially low, everyone’s kids go to the same school, and the National Anthem plays at the movie theater before every film. Those are some of my memories of Guantánamo Bay. Others have different memories. As the Guantánamo Public Memory Project grows it will provide many more pieces and perspectives to the history of the base, with the context and color to foster understanding and further interest in the Pearl of the Antilles. It will be nice to see if you can help steer the dialog away from the pervasive and singularly-focused public perception of the base being strictly a prison of some sort. Congratulations on the appointment.